Hi friend! I hope you had a magical holiday season with your friends and loved ones. I had a pretty great Christmas and was able to see almost every single cousin, aunt, uncle, and grandparent on both sides of the family, which is no small feat when you consider there are over 20 of us on one side alone. However, now that the holiday festivities are winding down, I’m excited to reset my diet and get ready for the New Year feeling fab. With that being said, just because you’re eating clean doesn’t mean you have to forgo delicious treats! If you use clean ingredients and avoid refined sugars as much as possible you can create healthy indulgences to enjoy mindfully even while detoxing all of our Christmas guilty pleasures. A key to healthy and lasting weight loss or detoxification is to support the specific organs of your body that break down harmful toxins that you breathe, ingest, or absorb. You can do that by making sure you incorporate Liver Loving Herbs into your daily life and by cleaning up the food you eat so that you don’t overwhelm your digestive system, your liver, your kidney, your lungs, or your skin with food dyes, hormone disrupting pesticides, inflammatory fats and flours. Luckily for you that just means you have to be a little bit more creative with your indulgences. Chocolate is not inherently a bad food, but most chocolate you find at the grocery or convenience store is full of those nasty fats, fillers, and preservatives you want to avoid. By picking up your own raw cacao or organic cocoa you can make tons of delicious, nourishing treats that won’t leave you feeling deprived and cranky in the New Year. 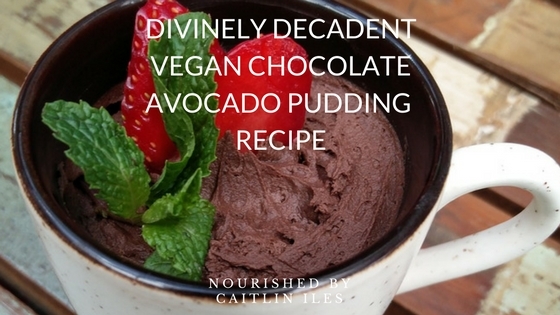 As a bonus, this chocolate pudding is jam-packed with satiating healthy fats from coconut milk and avocado, both of which, when consumed mindfully, will help keep you fuller for longer and be a great tool in effective weight management. 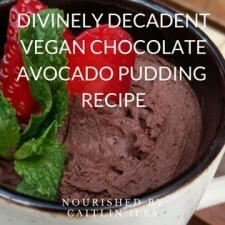 This pudding is the perfect way to satisfy sweet cravings while loading up on healthy fats and antioxidants! In a bowl whip together avocado, coconut milk, vanilla, sea salt, and honey using egg beaters. You can also use a mini food processor for a silky smooth texture. Add tapioca starch and whip until fully incorporated. Add raw cacao and whip again until smooth with no visible chunks. Divide into small serving cups and chill 30-60 minutes. Top with coconut milk whipped cream and enjoy as is. Or use as a filling in trifles, pies, and tarts. Well that’s all for today friend! I hope you enjoy your New Year’s celebrations. If you’re looking for some extra support as you make your healthy lifestyle changes make sure you download my FREE 7 Day Healthy Detox Meal Plan right here!